I was captivated. I stood in the store staring at it. Why was it called the Singing Butler? Who was the couple? Why are they dancing on a beach, in fancy clothes in the rain? 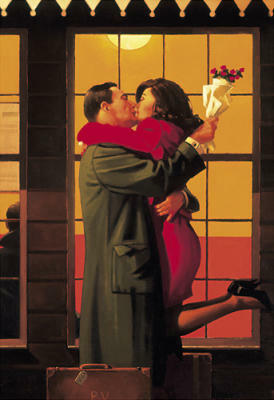 After I bought it and hung it in my dining room I started looking up Jack Vettriano’s other work. I came to the realization that I enjoy his art because it makes me ask questions, and those questions automatically lead to a story. I’m a writer. I love stories. But let’s back up a little. 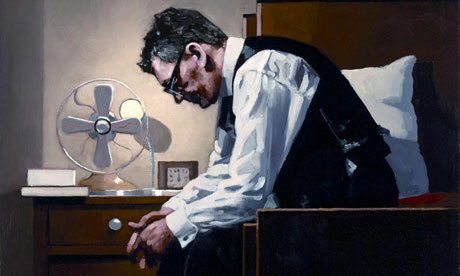 Who is Jack Vettriano? Born in Scotland, he quit school at sixteen to be an apprentice to a mining engineer. In the 1970’s a girlfriend gave him his first watercolor set for his 21st birthday. For years he studied and copied artists like Monet and Van Gogh until he got up the nerve many years later to show some of his pieces. In 1992, three works were accepted by The Royal Academy in London for the Summer Exhibition and later in the same year his first solo exhibition was a sell-out. Even with this success he was panned by critics in Britain as a” biscuit tin” artist. I’m not certain, but I think this is similiar to a novelist writing a sweeping epic that readers adore but reviewers from The Times say it’s like reading The Poky Little Puppy. Did this stop Vettriano from painting? No. In November 1999, Vettriano’s work was shown for the first time in New York, when twenty paintings were displayed at The International 20th Century Arts Fair at The Armory. Fifty collectors from the UK flew out for the opening night of the Fair and all twenty paintings were sold out within an hour of the opening. Not bad for a biscuit tin artist. 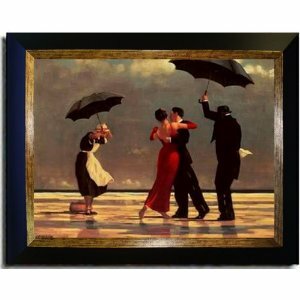 Vettriano’s style has been compared to some of the great realist painters of America and England. His work has been likened to that of Walter Sickert and Edward Hopper. Royalites from reprints, posters and postcards of his work rake in over half a million dollars a year and The Singing Butler is the best selling poster in the world. Although I’ve heard his paintings have recently taken a dark turn — (no wonder!) Vettriano keeps doing what he loves and still lives in Scotland. His self-portrait (way to go Jack!) will hang in The Scotland National Portrait Gallery in October. I find it interesting that his self-portrait is called The Weight. Does the painting and the title pique your interest? What’s the story here? Love or hate his art Jack Vettriano never gave up. I hope you find inspiration in his story and never give up on your dreams. 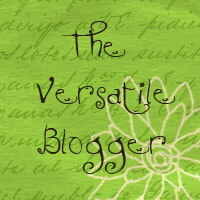 Do you have a favorite struggling artist, muscian or writer story? Someone who went after their dreams no matter what the critics said? 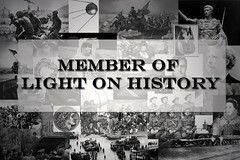 How does their story inspire you to go after your dreams? Have you gone after a dream, had others throw up blocks or criticism and instead of quitting, you kept going and triumphed? I’d love to hear your story. I’ll be away from my desk for a couple of days but I’ll make certain I reply to your comments the moment I return. Thanks for understanding!